Happy third birthday to my sweet Vienna! We’ll hopefully be spending a couple hours at the park – her favorite place to go run run run! I don’t know if it’s her actual birthday today, of course; she arrived at my house in September and we could only guess at her age. Which would put her birthday around this time of year. I picked valentines day because, well, I’m single and need something else to celebrate today, ya know? So we celebrate my girl each year! Impression Obsession came out with a couple cute stamps – My Best Friend, and Love Language –I wasn’t sure what size they were when I ordered them, but Love Language is a little bigger than My Best Friend – so I ended up making a card with a foreground stamp and background stamp by stamping “off” the first pass of ink on the background image. That way it only stamped a little of the ink, and made it lighter in the background. If you need to see the colors from my palette, check out this post. 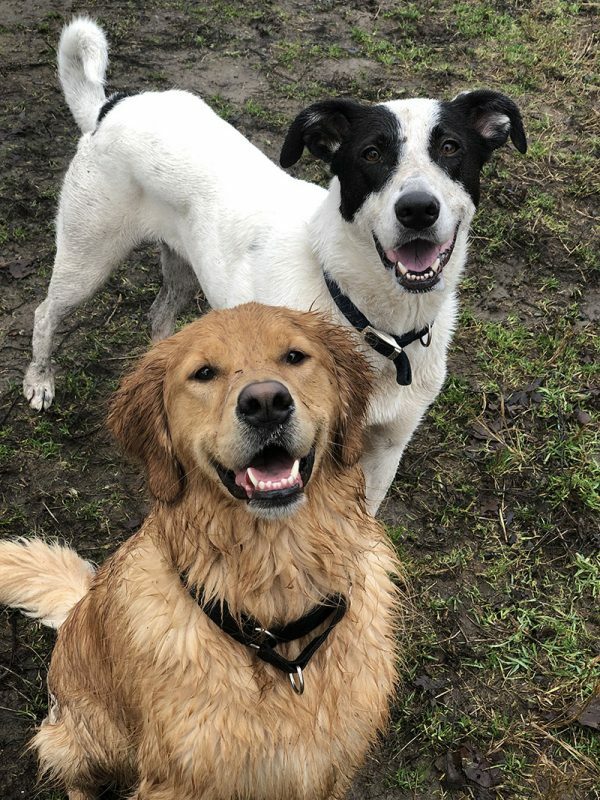 This is probably us today….. mud and smiles! Oh wow, happy birthday to your pup – I love the idea of picking Valentine’s Day as her birthday. And I love that self portrait card too! Aww, sending happy birthday wishes for your beautiful girl, Vienna. Your pups are so sweet, have grown into lovely furbabies, and I love seeing them so happy. BTW, about the birthday, I work with a dog rescue, and we often don’t know the dogs’ “real” birthdays since most come from shelters or were strays. We celebrate their “gotcha” days (aka-their adoption day) instead of a birthday since so many are unknown. Just saying, it’s no less of a celebration! We made an educated guess that V was 8 months or so when she came to me…that put it in February, so Valentines Day seemed perfect 🙂 She likes having 2 parties a year! She’s a great reason to celebrate Valentine’s! Happy Birthday Vienna! I saw you and G had a great time by the water. 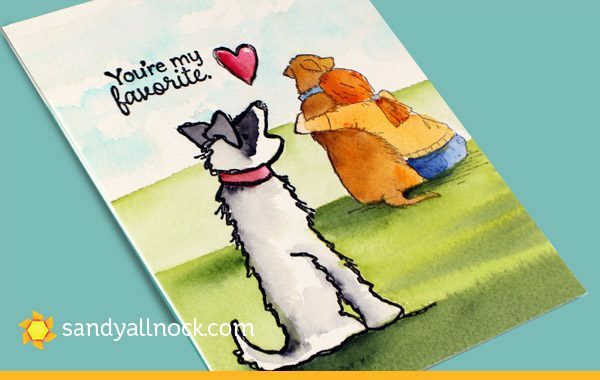 Gorgeous card Sandy and when I hear you talking with so much love and warmth in your voice about your sweet dogs, I miss mine. My dog passed away 12 years ago and still is missed. Enjoy your lovely dogs, I know I enjoy from a distance (live in the Netherlands)your dogs to. Awe, look at those two pups!!! Loving the great outdoors; too cute!!! The video is so fun & I love the portrayal of Vienna sitting in the background looking onward to her loving family…I get that…being a mom looking at her family with loving eyes! You have such a beautiful heart & soul Sandy!!! Thanks so much for giving us such a fantastic view into your heart!!! Happy birthday Vienna!!! You make my mornings. Loved, loved, loved this. When your dogs run, I am just amazed at the joie de vive (sp?) they exude. I wish I could find running around to be that much fun, I wouldn’t be quite so over-padded like I am. Your card tells such a story. Thank you, talented lady, for letting us into your life of art and animals. Such a super sweet card!! I loved watching your dogs play. They are so adorable!! That was fun! I love watching your pups playing, running, swimming… The card is great too – at first I thought it looked sad, because Vienna was kinda left out. But after listening to the voiceover, telling me that Vienna was totally okay with that, it became very happy again. Thank you for the great tips on depth of field and clouds – every little bit helps!